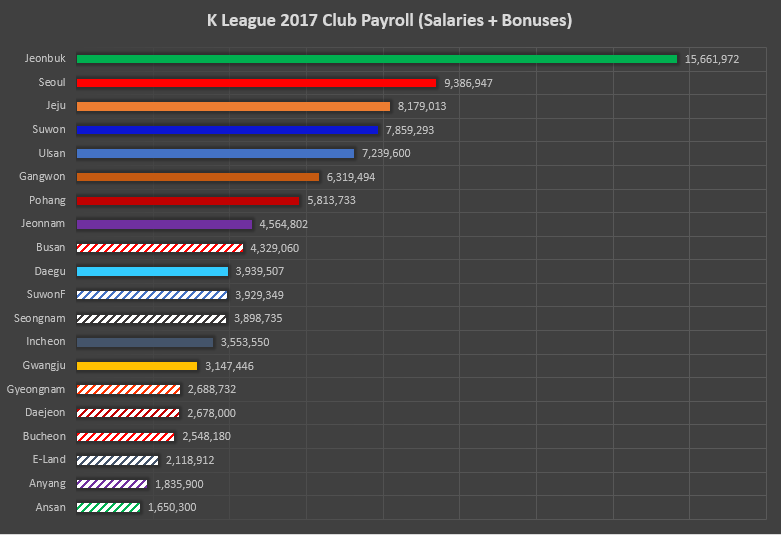 A couple weeks ago, the K League released their salary information for the 2017 season, allowing us to see how much clubs are paying their players. In this post, we will break down some of the information for this past season, before looking at some historical data. A couple of acknowledgements before we begin. First, a tip of the hat to Jae Chee, who kindly allowed me to borrow some similar metrics/formatting from his 2015 article after I began this post. Second, a tip of the hat to the good folks over at K League United who cover the Korean domestic scene well in English. Third, to the weather, because if it wasn’t -35 C I’d be doing something else outside than spending my Boxing Day crunching numbers. All information is listed in thousands of South Korean won, which conveniently enough gives a rough estimate of USD (15,661,972 thousands of KRW= roughly $15,661,972 USD). All data in thousands of won. Data as shown can roughly be translated to USD. (5,000,000 thousands of won = 5,000,000 USD). Classic clubs in full colour, Challenge clubs with pattern. As we will explore later, Jeonbuk’s dominant spending over the past few seasons, growing to 15.6 billion won this season, makes them the uncontested financial force in the K League. The champions spent 60% more than Seoul, their closest challengers, and nearly double the budget of the Suwon Bluewings, once thought of as the financial force in Korean football. The amount that the Green Machine paid in bonuses is superior to the entire payroll of top division club Gwangju and equivalent (more or less) to Incheon’s. It is also equivalent to the total of bonuses paid by all 9 second division teams. Not unusually, of the 9 top spending clubs, 8 are backed by a corporation or chaebol, with the notable exception being Gangwon. The promoted club’s huge spending spree in the last Winter Transfer Window give them a payroll of 6 billion won, which is extremely significant for a government-owned club in a league whose best sides rely on corporate ownership. Seoul E-Land, meanwhile, find themselves near the bottom of the table, spending less than almost all the government-owned clubs. In the first division, the top 6 spending sides (even excluding bonuses) finished above the split and in the top 6, while the bottom 6 finished below the split. Incheon and Gwangju both took a financial risk this year – by not investing. Both relegation-destined sides spent less money on salaries than three second-tier clubs. For Gwangju, lack of investment would see them relegated, but Incheon somehow managed to beat the odds for yet another near, finishing a solid 9th. In the second division, three sides spent more than at least one Classic club (Busan, Suwon FC and Seongnam), but only 2 made the promotion playoffs and none managed promotion. Corporate-backed Busan spent more than 3 Classic clubs and a considerable amount more than Challenge winners Gyeongnam but weren’t able to return to the top tier. 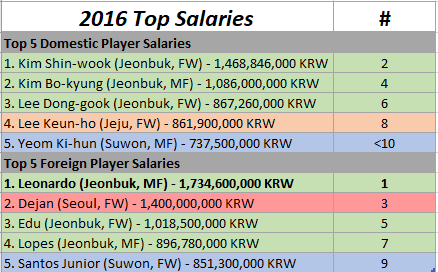 If we exclude bonuses, Suwon FC had the highest average salary of the second tier. Payroll data in thousands of won. This table compares in each league the rank of each team in their respective division by payroll (team who paid the most gets 1, team who paid the least gets the lowest number) with their league ranking. For the K League Classic, the ranking ends at Round 33 (before the split divisions) so that each team will be evaluated based on the same terms. In both leagues, the military club (Sangju Sangmu for Classic, Asan Mugunghwa for Challenge) were ignored in the league table (ie Gwangju finished 12th, but since we’re ignoring Sangju they move up to 11th). However, games involving those sides were kept, which distorts things a little. Nonetheless, the first thing that struck me is how most teams more or less place where they paid in salary. 9 of the 11 Classic clubs found themselves within 1 place between both rankings, while Ulsan ended up finishing 5th after the split anyways. 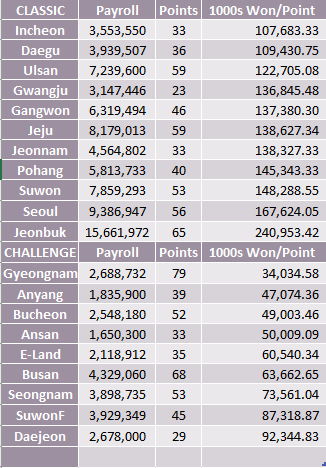 Things were a little more varied in the Challenge, with Bucheon and Anyang outperforming with a higher league ranking by of at least 2. The biggest winner is definitely Gyeongnam. Their payroll was 4th in the challenge, but they handily won the title. 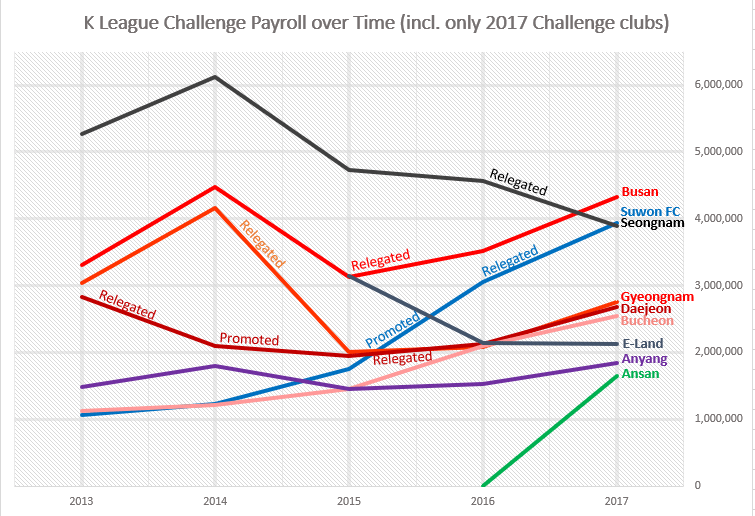 Going back to the previous category, if we remove bonuses (that they likely paid due to winning promotion), their payroll was actually the 4th-lowest in the Challenge. While the Classic champions spent their way to dominance, the Challenge champions relied heavily on good scouting and integration of foreign players (Marcao’s 21 goals helped) as well as team cohesion. Seoul are the Classic’s biggest losers, finishing 3 places lower in the league ranking and out of the Asian Champions League. In the second tier, Suwon FC didn’t even make the playoffs despite having 1.5 times the budget of Bucheon, who beat them, but it is my beloved club Daejeon who must wear the crown of indignity, finishing dead-last (not even close) in the Challenge despite having a mid-table wage. Payroll is in thousands of won. Sangju Sangmu and Asan Mugunghwa are excluded as military sides. This table seeks to demonstrate how much each point cost a team in payroll (salary + bonuses). The K League Classic data is up to Round 33, the last round before the split divisions, and the K League Challenge data is the whole season. The payroll for both divisions is for the whole season (so technically because of bonuses this distorts the Classic data a little and as such direct comparisons between Classic and Challenge should not be made). As expected, every point cost a lot (a lot, a lot, a lot) for Jeonbuk, with a draw being worth 241 million won. They are followed by the two other “big” clubs, Suwon and Seoul. Incheon, Daegu and Ulsan did very well, with the first two sides managing to stay up on a lower payroll (much efficient!). 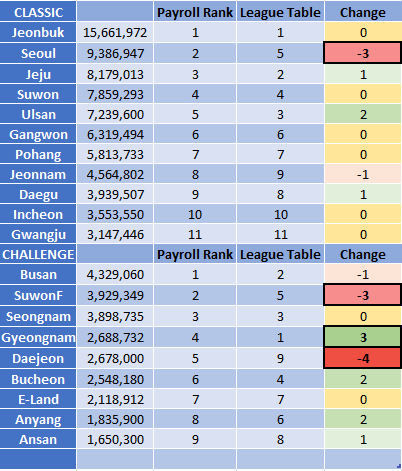 Though I don’t have the full data, Incheon does seem to garner a reputation of being extremely efficient (low payroll, but enough points to stay up) across multiple seasons. Similar analysis done by Jae Chee in 2015 had them finish 2nd in this table, and as we’ll see in the next section, their wage bill hasn’t changed too much in the past 3 years. In the Challenge, Gyeongnam once again solidify their newfound reputation of financial champions, spending only 34 million won for each of their 79 points. Anyang and Bucheon round out the top three in efficiency. Daejeon Citizen bears once again the crown of shame (shame, shame, shame) with 92 million won for each of their pitiful 29 points. Suwon FC and Seongnam FC round out the three least efficient second division clubs. This chart demonstrates the percentage of salary (excl. bonuses) clubs pay to domestic players (light gray) and foreign players (dark gray). This is not an average. In other words, each club has between 3-4 foreign players that make a quarter of the top division’s cash (see the average category – apologies, the gridlines didn’t show…). Jeonnam (38.78%! ), Incheon (36.04%) and Suwon (33.85%) allot more of their salary total to foreign players. Gangwon, Pohang and Jeju (all around 18%) spend the least. Of those three, both Gangwon and Jeju have the maximum of 4 foreign players. Though I won’t publish the chart for the sake of not data-overloading, Suwon FC (28.34%) allotted the most in the Challenge to foreign players, while Seongnam (10.83%) paid the least, though they only had 2 foreigners. Gyeongnam (11.85%) paid the second lowest, which suggests that their star Marcao, who scored 21 goals last season in the K League Challenge, isn’t get paid! 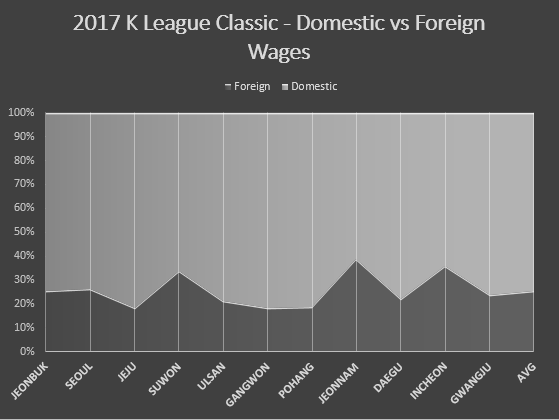 Furthermore, the K League Classic (25.27%) pays more to foreign players than the K League Challenge (20.45%). Interestingly, the K League’s youngest club, Ansan Greeners, spent the second most on foreigners (26.39%) which is similar to Seoul E-Land back in 2015, who spent 29.27% in their inaugural season, both considerably higher than the second tier average. Correlation doesn’t equal causation, but this does suggest that new clubs rely/invest in foreign players more heavily than the league regulars. Pohang Steelers have garnered a reputation for being the most “Korean-friendly” side since they won the K League title in 2013 without any foreigners under the leadership of Hwang Sun-hong. They have since begun to sign foreign players, and whether or not this was Hwang’s philosophy or the board’s (probably the board’s) we will never know. Nonetheless, a bonus graph for you Steelers fans shows that as a percentage Pohang remain quite content to continue with this club tradition, even if it’s less apparent. The K League doesn’t disclose too many individual salaries, except for the top 5 in both the foreign and domestic players categories, and that time they sort-of accidentally disclosed former Anyang defender Austin Berry’s salary (since he was their only foreign player). Weird, but that’s how the K League rolls. Jeonbuk’s dominance is shown with 7 out of the 10 players whose financial information is disclosed by the K League wearing the Jeonbuk green. 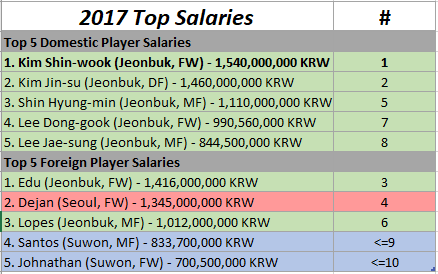 As Lee Keun-ho is not listed in the domestic player salaries section, we can presume that the veteran Korean may have taken a pay cut to go to Gangwon (see next slide). 6 of the most well-off players in the 2016 K League played for Jeonbuk. Leonardo’s salary of 1.73 billion won is likely a K League record. 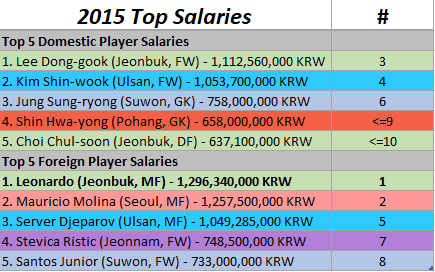 Much more diversity in 2015, with Jeonnam, Ulsan and Pohang breaking the bank, but Jeonbuk still have 2 in the top 3. A couple asterisks about this chart – Gangwon and Daegu played their first seasons in the Classic in 2017, so data 2016 and before is them competing in the second tier. Gwangju played their first Classic season in 2015, so data prior to that is second division data. Obviously what stands out yet again is Jeonbuk’s ascension. It’s not a question of chance that since making the push to be top spenders in the league in 2013-14, they have won 3/4 titles (and the 2016 title they lost due to a points deduction). What’s more, the inequality in the league is growing, with the gap between Jeonbuk and second growing every season. In 2014, it stood at about 1.9 billion won; today, it is 6.3 billion won. With Jeonbuk poised to pluck more low-hanging fruit (for them) in the next transfer window with Hong Jeong-ho and Son Jun-ho both reportedly in talks with the Green Machine, that payroll could continue to increase in years to come, and Jeonbuk’s 4 seasons of success on and off-the-pitch can be expected to turn perhaps into a decade of dominance. Suwon is another interesting tale, but for different reasons. In 2013, they were top spenders; today, they are 4th. 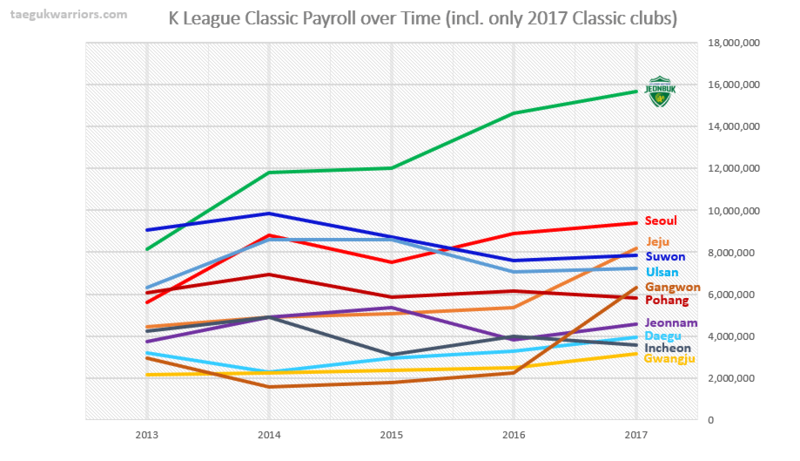 While the league’s salaries have generally increased over the past 5 years, Suwon are, along with Pohang (marginally) the only current Classic team to have a smaller payroll than when the K League started releasing these figures in 2013. A reason could be that Samsung is reportedly is scaling back its stake in their sports teams (see: rapid decline of Samsung Lions in KBO). With the sale of Johnathan and departure of Santos, two very expensive foreign players, we will be able to accurately determine in this transfer window whether or not Suwon will descend even lower, or try to maintain their new 8 billion won budget in the past two seasons. This season also saw two teams have a sharp increase in their payroll. Gangwon and Jeju saw their salary budget increase by 183% (!!) and 52% from the previous year. These increases are the 1st and 3rd biggest swings over an off-season since the promotion-relegation format was introduced. Only 4 teams across both tiers decreased their budgets in the past year: Seoul E-Land (-1%), Pohang (-6%), Incheon (-10%), Seongnam (-15%). The K League Challenge has seen constant investment every season since its inception (treat the 2013 to 2014 figure with caution, there were three new teams) and this season was no exception. The first tier saw a big bump from 2013 to 2014, but that bump was practically annulled in 2016 after two seasons of declining wages. 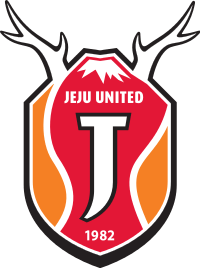 This past year saw another significant bump thanks to Gangwon, Jeju and Jeonbuk heavily increasing their budgets. Both leagues combined increased as well, breaking the 100 billion won plateau for the first time. We will see if that is maintained next year. Hyundai, owns, through its various branches, three clubs in the league – Jeonbuk Hyundai, Ulsan Hyundai and Busan I’Park. When the Hyundai conglomerate decided to make an investment in the league in 2014, both Jeonbuk and Ulsan seem on first glance to have gotten an equitable bump. The 2015 season saw no significant investment for either side, but in 2016 as Jeonbuk soared to new heights with a 3 billion won push, Ulsan saw their payroll decrease by a billion. In 2017, both Classic Hyundai clubs saw an increase, but Ulsan’s jump was marginal in comparison to Jeonbuk’s. Bosses’ favorites? Busan, meanwhile, have generally had the same piece of the pie over the years. Purple is for Jeonnam (I know their main colour is yellow) and Pohang gets red. This is a split of the payrolls of the two POSCO clubs. In 2015, they were near parity in wage expenses, but the gap was restored in 2016 as the traditional “smaller” club Jeonnam suffered the most with a sharp decrease. Was it because POSCO cut their funding? Or was it Jeonnam that made an administrative decision, having spent too much in 2015? Who knows. Let me know if you want other statistics, and comment your thoughts on your club’s numbers! 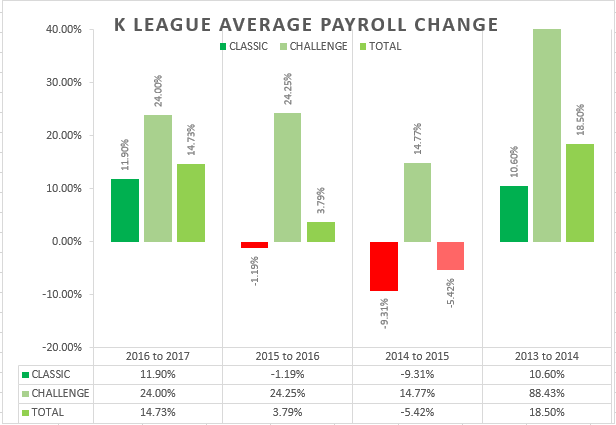 In the next post, we will compare the K League’s payroll data with those of other leagues… including the KBO. 17 for 2017: Guus Hiddink returns to Korea?! Whoa! That’s a hell of an analysis!! I think I need to go back through this, but brilliant stuff! I’m OCD-ing over the < =... It should read >=… the ranking is greater than or equal to, we don’t know because salaries in the other category outside of the top 5 may influence ranking without us knowing… those who saw the mistake will know what I’m talking about haha. Oh my goodness. That report was incredible and very thorough. I am in total praise and awe of this analysis, nothing short of superb. Thanks for the kind words. More to come, hopefully! This is nothing short of… amazing! How did you find the original data?! I searched Daum but did not find anything. Then I emailed a Korean reporter, but got no reply. Do you have a link? Thank you much in advance. Lee Geun-ho’s thighs, I only have one request… tell his feet to kick the ball towards the goal at the World Cup. He’s allergic to scoring but so good at everything else..! I got the data from the K League website. There’s stuff I omitted for fear of data overload (I think I did that anyways). Feel free to play around with it. I can also share my Excel spreadsheet to play with if you’re keen haha. It’s in the attachment under the article title. Yup, its the same as in the Daum thing posted above. Though I had to do some research to scrape older numbers.